This was the first ever West Coast Birdwatching trip to Skokholm, a magical island owned and managed by the Wildlife Trust of South & West Wales. It preceded a similar trip to neighbouring Skomer the following weekend. Kate, Geoff, Jonathan, Ken, Abhi, Toby, Margaret, Janet & Paul were all visiting Skokholm overnight for the first time, so anticipation was palpable when we met to load our luggage onto the Dale Princess at Martin’s Haven. And what a ‘loading’ it was: all our luggage, all the food for our trip, & all the food for the lichen course that was following our trip! The unloading onto Skokholm was not straightforward either, as due to the wind direction and swell we landed at Blacksmiths, which is essentially means putting the boat nose on to some rocks, with a fair amount of lugging up a slope to the waiting Gator. The tea & biscuits at the Observatory were very welcome after that! After everyone settled into the accommodation between the cottage, the central block and the kitchen block, awe were ready for a nice walk accompanied by wardens Richard Brown and Giselle Eagle, including a guided tour of the lighthouse, which doubles up as their home. The next 3 days were spent birdwatching around the island, sometimes altogether, at other times people went off on their own to explore, always catching up for a cuppa & cake or meals at the Observatory. And what food we had – catering was courtesy of Sam and Wendy, who not only provided us with 3 meals a day, but cake morning & afternoon, and they also catered for all dietary needs, and we had a few between us. Thus the impromptu speech from Ken at the end of our last evening meal, and the round of applause that followed, really were well deserved. The main aims of the trip were to improve everyone’s confidence in identifying autumn migrants, including the tricky ‘little brown (or olive) jobs’, to know where and when to look, and to hopefully see some good birds on the way – but we were at the weather’s mercy on this one! By the end of our 3 days we had seen no less than 57 species between us, and got to grips with tricky species pairs including Meadow & Rock Pipits, and Chiffchaff & Willow Warbler. The birds everyone enjoyed most were probably the Storm Petrels (including a chick being weighed and watching adults visiting nest sights through a Night Vision camera), Manx Shearwaters at night, and a Firecrest which eventually showed really well in the courtyard. We also had a couple of chances to do some sea-watching in the brisk south-westerly winds. Everyone enjoyed the whole experience, which included Common Dolphin and Harbour Porpoise, Slow Worms, various butterflies and day-flying moths and of course the Grey Seals. 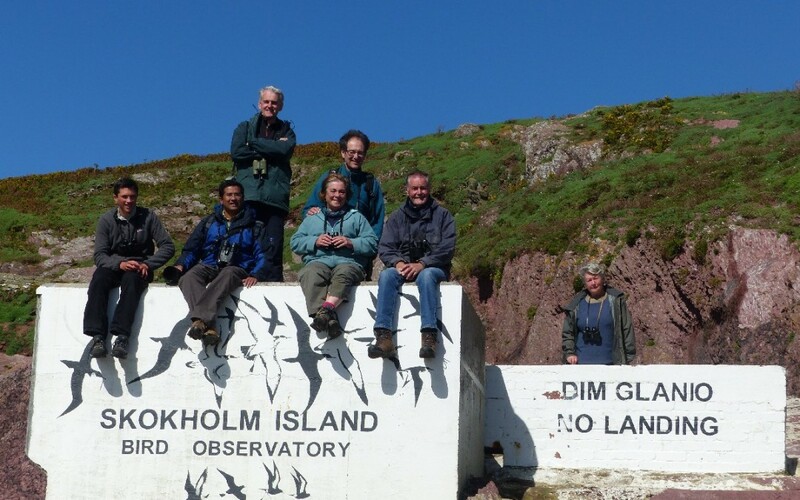 We are currently trying to finalise a spring trip to Skokholm in 2016 – keep an eye on the web-site for news!